Asia Pacific Predator League 2018, Predator Gaming’s merk new DOTA 2 league and the most anticipated eSports competition, recently concluded its Philippine Leg at the High Grounds Café. Quid Pro Quo takes home PHP 50,000.00 and will be flying to Indonesia to represent the Philippines in the finals. Setting the mood for an intense competition, the High Grounds Café (Tomas Morato, Quezon City) was adorned with black stone boulders, crystals, snow, and grass to create an ice dungeon representative of Predator Gaming’s frost-forged vibe. This set-up served as the backdrop for the Philippine finals, putting a dramatic end to the national leg. 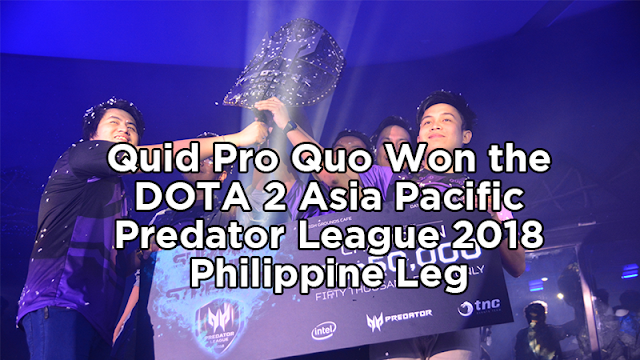 Following around 6 hours of DOTA 2 action, Quid Pro Quo emerged as the victor of the Philippine finals, besting Alpha Gaming on the 3rd round. Prior to succeeding in the national finals, Quid Pro Quo had previously competed and won in the North Luzon leg of the competition. Quid Pro Quo takes home PHP 50,000.00 from the PHP 220,000.00 Philippine eliminations prize pool; Alpha Gaming takes home PHP 30,000.00; and Viggo.Net and NCGC.Davao take home PHP 10,000.00 each. Quid Pro Quo will be moving on to compete in the final round to be held in Indonesia. Vying for the $150,000.00 (approximately 7.5M Pesos) prize pool, Quid Pro Quo will be competing against the national winners of 6 other countries in Asia Pacific, namely Singapore, Malaysia, Thailand, India, Hong Kong, and Indonesia. Predator Gaming established Predator League as a means to empower amateur gamers to showcase their skills and talent on a global scene. Endeavoring to discover and put the spotlight on both professional and non-professional gamers, Predator League aims to capture fresh talent from the Philippines and the Pan Asia Pacific region’s bustling amateur eSports scene, particularly for DOTA 2. - The Philippine Leg consisted of 4 Regional Qualifiers and the National Finals. The Regional Qualifiers were held in Mindanao (TNC Bukidnon), Visayas (TNC Bacolod), North Luzon (TNC La Union), and NCR (TNC Marikina). The National Finals was held in NCR at the High Grounds Café. - THENET.COM is the official organizing and venue partner of Predator Gaming Philippines for the Predator League 2018 Qualifiers. - A prize pool of S150,000.00 has been set for the finals. Tell us what can you say regarding the victory of Quid Pro Quo by leaving your comment below.